OnTap Beer Enhancer Aims to Enliven Macrobrew – AGWB. Has your ability to stomach the bland taste of macrobrew been spoiled by the rising availability and variety of craft beer? A new company has come out with a product that supposedly can save you from having to settle for boring Bud. 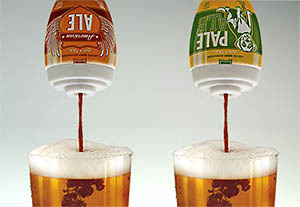 OnTap Beer is a “liquid beer enhancer,” and the makers suggest you can add a squirt to your pint of big beer to turn it into a more exciting drinking experience. OnTap Beer is based in Littleton, CO, a Denver suburb with plenty of access to real craft beer, but the products are also available for purchase online. For $4.50–$5, you can order a bottle of either “American Ale” or “Pale Ale” flavoring. One bottle will “convert” up to 18 regular bottles of what the company refers to as “domestic” brew into something that tastes more like craft beer. Brewbound got the skinny on the mixture contained in OnTap, which is made of water, propylene glycol, and natural and artificial flavors. The flavoring agent doesn’t add any calories or alcohol to the glass, just aroma and taste, supposedly. The company uses money savings as a selling point, since you could theoretically buy cheap macrobrew bottles instead of “expensive” craft brew ones and still enjoy them. We haven’t had a chance to talk with anyone who’s actually tried OnTap, so can’t speak to the success or failure of the product. We’re thinking OnTap might be good in a tight pinch, but since even most sports stadiums offer craft beer options nowadays, we’re not sure what the use case would be. Will you try it? Let us know if you do.